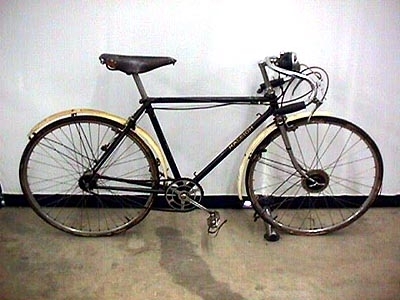 This is the Raleigh Record Ace at the Owls Head Transportation Museum. The serial number is: AD 94979. It is a 3 spd, with Strumey-Archer shifter marked "Trigger Control" with Patent Applied For stamped on the shifter as well. No window or indicator of any kind on shifter body. The front hub is a DynoHub and is stamped with "MK II". The rear hub is stamped "Sturmey Archer AW-9". The bike is equipped with Bluemels "Noweight" mudguards, the rear one is in pretty sad shape (unfortunate because it has a lovely Raleigh logo decal on it). 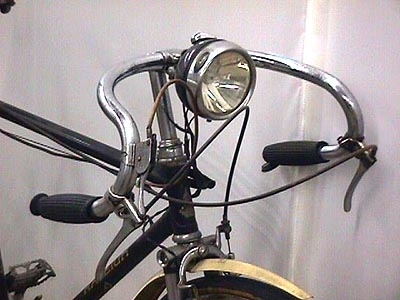 The headlamp is marked DynoHub and has two bulbs, with a rotary switch for dim, bright, off, etc. A3963 and G8721 serial numbers. The revived RRA was available in 1973 only, although the name gets recycled. Overall white with mustard yellow headtube and 5 1-inch wide bands on seattube, black pinstriping outlining head lugs, seat cluster lug, and fork crown. 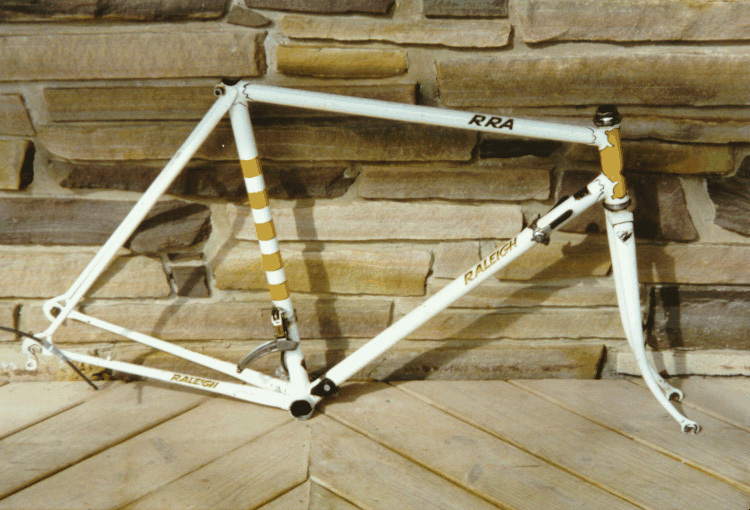 Slanted block lettering "RALEIGH" on downtube and chainstays, "RRA" on toptube. Letters are gold with black line centers. Reynolds 531 butted throughout, sticker at top of downtube and on each fork blade. Carlton "triangular" sticker at bottom of seattube. Conventional flat fork crown, triangular epaulets on top (as on International), with 2-inch long stiffening tangs on inside face of fork blades. Flat seat stay caps, stays reinforced at brake bridge. Chainstays dimpled at BB, both sides on right stay, inside of left stay. 1 brazed on cable guide/stop for rear der cable on top of right stay. "CC" cutout in bottom bracket. Campy dropouts without eyelets; rears are vertical. Top tube clamps for rear brake cable. Stronglight 93 crankset & BB, 52 & 42T ring, 170 mm arms. Simplex Super LJ alloy derailers & shifters (very good alloy ones, no plastic). Simplex downtube shifters, steel with black plastic lever tips. Simplex steel & black plastic downtube/BB shift cable guide clamp. Clamp can handle bare cable or cable housing. Simplex seatpost with a "Simplex" badge rivet on at top, brass lettering on a blue background. Weinmann 500 sidepull brakes. Perforated brake levers with quick release mechanism (as on International). Maillard 700 high flange hubs. AVA or Mavic tubular rims. TTT record stem, probably both recessed allen on clamp and expander hardware. 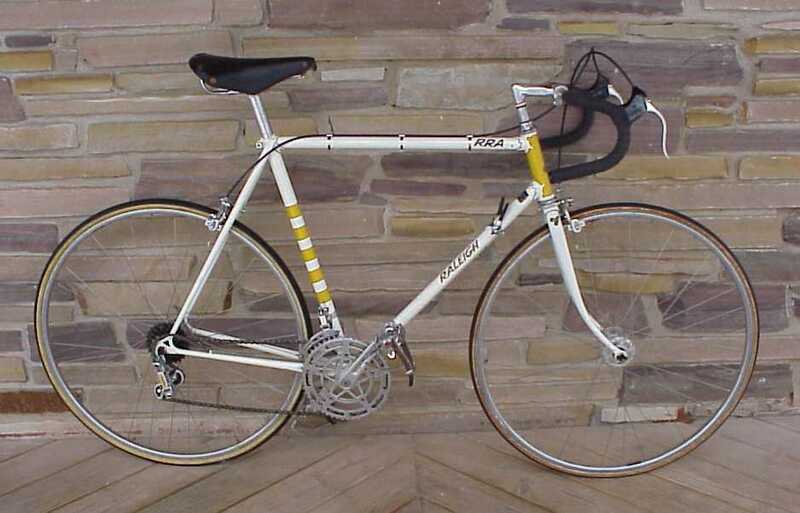 Notes: The early Simplex Super LJ front derailers used on this bike had a built-in cable housing stop at the clamp hinge, and the cable was routed through the clamp hinge. "Simplex" on front arm was black lettering on a gold background. "S" star stamped/cast on cage and clamp arm. Cage was chromed, and front edge of outer cage was flat. Cable clamp and throw arm were on the front of the derailer. Newer versions lacked the cable housing stop. The throw arm and cable clamp were on the rear of the derailer. "Simplex" on front arm was black lettering on a silver background. "S" star appeared only on the clamp, not on the cage. The front edge of the cage was rounded over and has a stainless steel appearance, not chromed.